She Royal Ministries Podcast Network delivers weekly Christian podcasts. 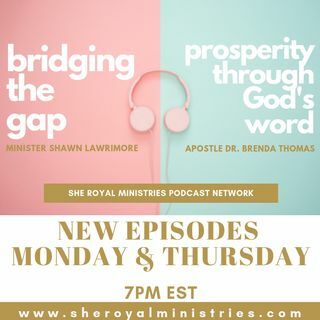 Bridging the Gap on Monday & Prosperity Through God's Word on Thursday at 7pm EST. Prophetess Nicole Woodson considers herself a Warrior Princess as she has dedicated her life to delivering God's Word and Intercessory Prayer. Each week, Prophetess Woodson provides spiritual love and prayer to support your walk with God. Vibrant, creative, gifted and anointed is Dr. Brenda Alston Thomas. Apostle Thomas received the Lord as her personal savior at an early age and ... See More upon receiving her call to the ministry, Apostle Thomas was licensed in December 1987, ordained in November 1988, and then later commissioned to the pastorate in November 1990. She attended Life In The Spirit School of Ministry, Christian Bible Institute and Light University. Also, Apostle Thomas has received an Honorary Doctorate of Divinity from Kingdom of God Apostolic and Prophetic Bible College.